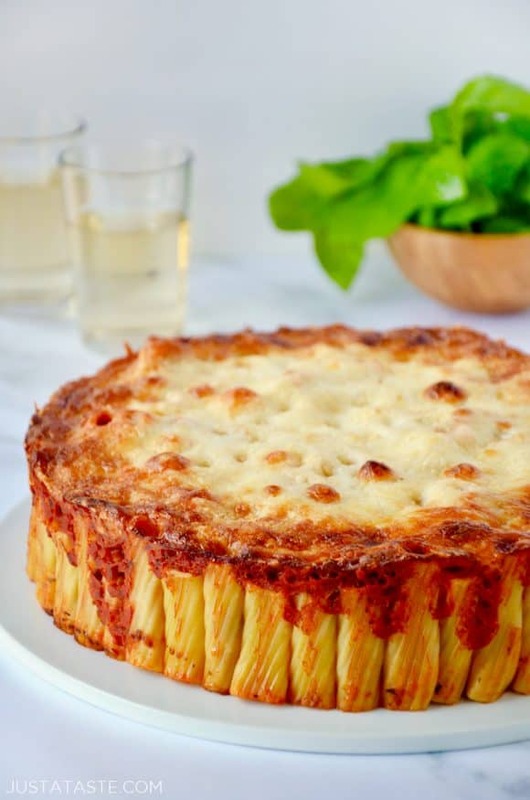 Take traditional pasta to a whole new level with a family favorite recipe for Easy Cheesy Rigatoni Pie. Have you ever seen ordinary pasta look more extraordinary? Just look at those tubes of tasty carbs standing at attention, filled with tangy marinara sauce and sporting a gooey, yet simultaneously crispy blanket of melted mozzarella and Parmesan cheeses. 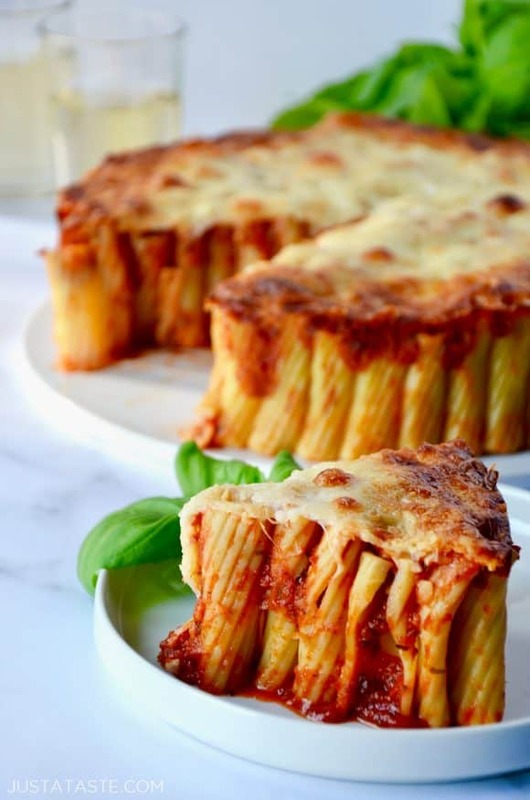 It’s rigatoni pie perfection. And all that separates you from a big ol’ slice of this savory satisfaction is five simple ingredients. This recipe is the definition of my mantra to keep things easy but impressive in the kitchen. I love a dish that looks and tastes like it took days to make but really didn’t tie you to your kitchen for more than an hour. 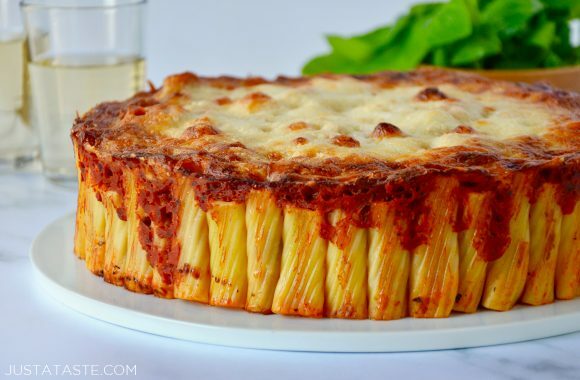 Perhaps the most laborious step to this eye-popping pasta pie is getting the rigatoni stacked in the pan. But once the noodles are upright, it’s mere minutes until this dish enters the oven. Depending on your time constraints, you can go the homemade or store-bought route for any of the above. And the final step? 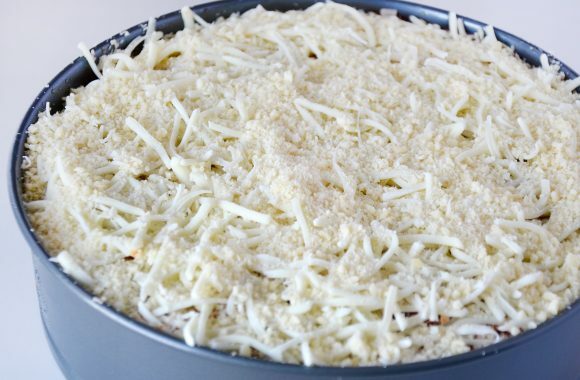 A hearty sprinkling of shredded mozzarella and grated Parmesan cheeses. And I mean hearty. We need enough cheese to create a comforter of creamy dairy over those upright tubes-o-sauce. Baking the rigatoni pie first covered with foil ensures the gooeyness factor, while a final few minutes uncovered ensures that white cheese takes on a deep golden brown color and slight crunch around the edges. We’re looking for a moon-like surface with craters of crunch. Say it with me now: CRATERS. OF. CRUNCH. Bring a large pot of salted water to a boil. Cook the pasta until it is barely al dente, about 8 minutes. Drain the pasta, transfer to a baking sheet and toss it with 1 tablespoon of olive oil. Grease a 9-inch springform pan with the remaining 1 tablespoon olive oil. 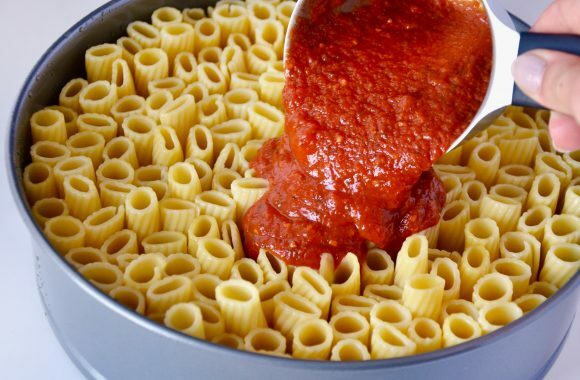 Using your hands, stand each tube of rigatoni up in the pan in a single layer covering the entire base of the pan. Pour the marinara sauce on top of the rigatoni then transfer the pan onto a foil-lined baking sheet. Top the marinara sauce with the shredded mozzarella and Parmesan then cover the pan with foil. 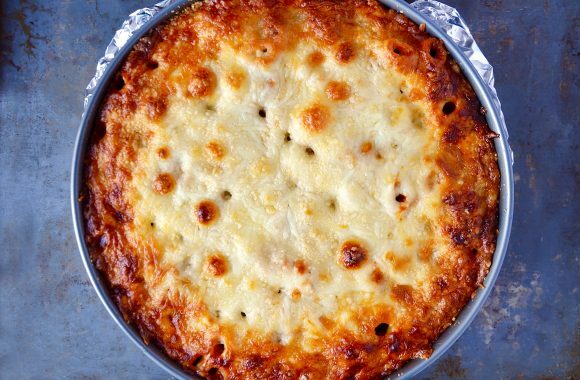 Bake the rigatoni pie for 30 minutes then remove the foil on top and bake it another 15 to 20 minutes until the cheese is golden brown. Remove the pan from the oven and let the rigatoni pie cool for 10 minutes before releasing the sides of the pan and slicing and serving the pie.